For many people in Austin (and around the world), mid-March brings feelings of jubilance, joy, and excitement. It’s the week of South by Southwest, a festival celebrating the art of music and filmmaking, as well as the unique experience from panels and functions anticipated by those from fandoms to working professionals. Streets and hotels will be filled to the brim with people who travel to Austin in droves for the annual event. Not everyone living in Austin is excited about the massive influx of visitors and tourists, though. It’s the ultimate dismay for Austinites looking to spend their week enjoying the city they love. Whether you’re looking to get far, far away from the madness of SXSW or looking for fun activities to do in Austin while avoiding the crowds altogether, we have a solution. If you’re one of the Austinites actively avoiding SXSW next week, we have compiled a local’s guide just for you. The Domain is the ultimate experience for residents living North of Austin. With the rapid expansions and many additions of restaurants, shops, and nightlife, the Domain has become the North Austin’s very own version of downtown. While you’re there, check out the Domain’s recent expansion, Rock Rose, at the Domain Northside. It has all the energy and charm of South Austin, but plentiful parking and no SXSW crowds. For more family-friendly activities, head slightly further north than the Domain, to rising small-town gems like Round Rock or Cedar Park. Substitute a run around Town Lake or a stroll in Zilker Park for a walk around Old Settlers Park in Round Rock or Brushy Creek Lake Park in Cedar Park. ) in Cedar Park. If you’re looking for more adventure, you could take a hike around Lake Georgetown or for more scenic activities, try the scenic lagoon, Blue Hole, in Georgetown. Avoid the chaos and music at night by attending an Austin Spurs Basketball game, a Texas Stars Hockey game, or Cirque du Soleil, at the H-E-B Center at Cedar Park. The Texas Hill Country has beautiful scenery and grounds open for picnics, tours, and wine tastings. Only minutes from Austin, you can take in the beautiful scenery of Texas while indulging in delicious food and wine from local wineries. We recommended these places to spend a day trip for winos and foodies. Spend a day in shopping heaven out in Fredericksburg, Texas, also located in the Texas Hill Country. Along with an endless number of both family-friendly and solo activities, Fredericksburg has over 150 shops as well as several wineries, restaurants, and breweries to kick back in. Fancy spending the night or a weekend there? They have boutique hotels and bed-and-breakfasts just for you. If you want to head South of Austin towards San Antonio, you could visit the La Cantera Resort in San Antonio. Equipped with multiple hot tubs, pools, and private cabanas, you can immerse yourself in the ultimate romantic getaway. Experience the history, the lavish spa, all while staying close to the best attraction in San Antonio – the Riverwalk! For a meditative experience, make your getaway to Zen at Tres Lunas. Yoga retreat packages can leave you feeling refreshed and at peace before you get back to the SXSW crowds. Learn more about our getaway recommendations. Staying in Austin during SXSW? You’re very, very brave. It’s also a high indicator that you either love your city too much to leave or you don’t have the time to travel anywhere else. You may not be able to get to your favorite bars and restaurants, but we have compiled some tips for those Austinites who plan to stay put during the madness that is SXSW. 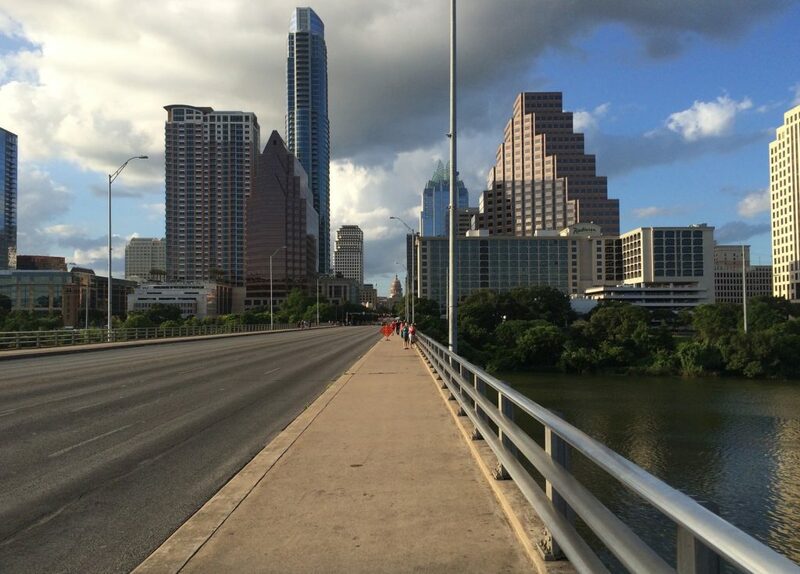 Here’s ways you can get around Austin while actively avoiding the crowds. The genius idea everyone’s been needing in their life. This app tracks check-in data from Instagram and FourSquare to let you know which places to avoid due to large crowds. With data for nightlife, food, coffee, and refuge, you’ll never have to endure a large crowd in a public place again. Although it’s likely you won’t see many green-coded places during SXSW, you can find out which ones are too overcrowded for your liking. So you venture out to your favorite bar, and it’s surprisingly not as crowded as you thought. You order a few drinks, maybe some food and right when you’re ready to pay the bill, tens of SXSW-goers walk in the door and occupy seats. With the unexpected rush, you have no idea when your waiter will bring you the bill. However, with the TabbedOut, you can pay your bill right through the app and fast-track your checkout. The app is completely free to download, just make sure the venue you’re visiting is on the list. Do yourself a favor and don’t eat at any restaurants listed on highly-rated blogs, tourism, or restaurant sites. These will likely make a lot of go-to lists for tourists and out-of-towners to visit during the SXSW festival. Staying far away from places like Magnolia Bakery and don’t visit Sixth Street for any reason. Fancy a good recommendation? Try this list of where to eat in Austin if you hate SXSW. The disappearance of Uber and Lyft after the Proposition 1 failed to pass last year leaves many wondering which company they’ll turn for rides. Locals can turn to the traditional option of calling for cabs or hopping on one of the Cap Metro buses (which will have extended hours during SXSW). With the increasing crowds and reluctance to call for a cab, Austinites can find solace in this comprehensive list of ridesharing companies operating in Austin. If you own a car and plan on doing things downtown, good luck to you. You can expect traffic congestion and street closures to force bumper-to-bumper traffic all throughout the Austin area as early as Friday, March 10th. You can find information on street closures here. South by Southwest is a glorious time for both locals and tourists to Austin. With many anticipated events and happenings, you can expect South by Southwest to be as big as ever. For those Austinites who feel an increasing need to move further away from the downtown Austin area, we help clients everyday move out of their homes and into new ones. Contact us today for a confidential evaluation of your home selling needs.